Have you been making do with a hydraulic system that doesn’t quite fit your needs? 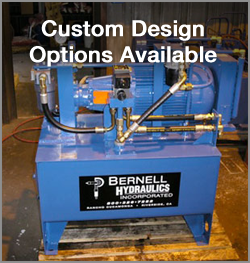 Why not invest in a custom system from Bernell Hydraulics? We have created plenty of different custom hydraulic systems in Whittier CA and we are eager to help with your project too. All you need is an idea–we’ll help you make that idea a functioning reality. Whether you have detailed design plans or just a general idea of what you want, we can help. Our engineering team can work with you to flesh out your idea and create exacting design specs to get you the performance and power you need. Then we can build your custom hydraulic system. All custom hydraulic systems in Whittier CA will be subjected to rigorous testing for quality control before being delivered to your work site, so you know you can depend on them. It’s hard enough keeping all the moving parts of a hydraulic system working in perfect harmony. This task only gets more challenging when you’re dealing with custom hydraulic systems in Whittier CA. Custom parts don’t necessarily come with handy little temperature and capacity guidelines from the manufacturer. Fortunately, you can get an expert eye on your custom system and make sure everything is working properly by bringing it to the experts at Bernell Hydraulics. We can identify worn or strained parts and provide replacements. If your custom hydraulic system uses name brand parts, we can order and install them for you. If you have a totally custom-made system, we can machine replacement parts for you. We’ve been in the hydraulics parts and service business since 1977, and we know how to treat customers right. We will come to your aid 24 hours a day in order to make sure that you get the best value out of your custom system.